For this post, I would like to share two very memorable experiences with you. The first experience that I would like to share happened only a day ago. We traveled to Sderot, a city that is only 10 miles away from the Gaza Strip. Everywhere you looked, you could see a bomb shelter. We also climbed to the top of a small hill in town and were able to see Gaza City. It was an indescribable feeling to look out and think of all the people that are unnecessarily suffering in Gaza. While looking out, a few of our counselors became emotional, as only a year ago they had friends who had been fighting in Gaza. After witnessing all of that. I still didn’t fully understand the gravity of the situation. Later, when we we were on the bus driving through Sderot, I saw a hundred kids walking out of school by themselves enjoying their daily lives — just like any other normal kids. However, it hit me at that moment that these seemingly normal kids have constant fear that a siren will go off, that their home will be attacked, or someone they love will be killed. Only after seeing these kids did I finally realize how difficult and complex the situation in Gaza is. The second memorable experience happened over the last week or so. As you know, last week we traveled through the Negev. We hiked through Ein Gedi, and also hiked Masada and Ein Ovdat and visited Ben Gurion’s grave. We went to Eilat to snorkel and experience the city. We floated in the salty water of the Dead Sea, then after a Shabbat filled with services, meaningful discussions, and lots of much needed relaxation, we headed out of the desert and (finally) reached Jerusalem. For me, arriving in Jerusalem was a symbolic experience. After the Jews spent forty years wandering through the desert, they finally reached Eretz Yisrael. 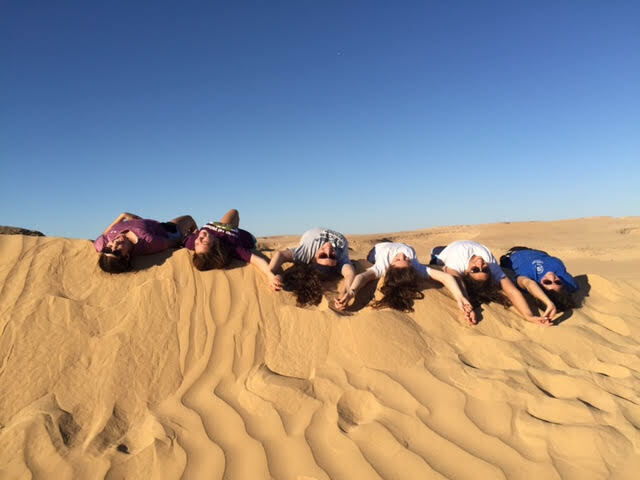 On Machon, after we traveled through the desert for a week (which is much less than 40 years! ), we finally arrived in the holiest place for the Jewish people. When we arrived in Jerusalem, we immediately went to Beit Ar-El, which is Young Judaea’s Year Course headquarters in Jerusalem. The atmosphere at Beit Ar-El solidified my decision to participate in Year Course. Prior to Machon, I was pretty positive I wanted to be a part of Year Course, but the feeling that I got at Beit Ar-El as well as the experiences I have had on Machon convinced me that I need to go. The next day, we went to Hezekiah’s tunnels. These incredible underground tunnels were built as a water system sometime between the ninth and seventh centuries B.C.E. All 52 of us went into the very dark and cramped tunnel for about an hourlong walk. There is only one way in and one way out of the tunnels. At some point, the water in the tunnel was up to our knees. Although this was definitely not the most comfortable experience, but it is something that most of us had never experienced before and it was fascinating to think of how long ago the tunnels were built under Jerusalem and that we were traveling through them in 2015. After the tunnels, we walked around the Old City and learned about its history. I had visited the Old City prior to this trip and had understood that many different people have lived in Jerusalem throughout history. Through this tour, especially because I am much older now than I was the first time I visited Jerusalem, I received a deeper understanding of its complexities as well as its beauty. Finally, towards the end of the day, we arrived at the Kotel. Touching the Kotel was an extremely special moment. Thinking about the millions of other Jews that have touched, and prayed, by the wall made me feel connected to the Jewish people as a whole. However, despite the spirituality of the experience, as an advocate for women’s rights, the inequality of the distribution of space at the Kotel was particularly unsettling for me. Although we live in a more progressive world, and Israel has made many advances regarding women’s rights, it is upsetting that, in this most holy of places, sexism and the unequal treatment of women is so apparent. My guy friends on Machon had all of the space in the world to pray and appreciate the moment and me and the many other women at the wall were cramped into a space 1/3 of the size (we later had a heated discussion about this issue). Learning and experiencing the heart of the Jewish religion was an overall enriching experience. On a lighter note, and as an update from my initial blog, I am thoroughly enjoying the food in Israel. I have eaten many Shawarma sandwiches, an Arctic (Israeli Popsicle), and am still searching for a Krembo (but I heard that I may have to wait until Hanukkah for one)! I hope that my blogs have conveyed that, so far, I have had many incredible experiences on this trip that have helped me grow as a person. I cannot wait to try more foods and continue to experience more of these life-changing experiences as we head to special interest week, during which I will be doing the sea to sea hike.